We have a number of different types of champagne toasting glasses that can be engraved with this cute Irish Claddagh Celtic design. Some of them are glass and others are crystal. 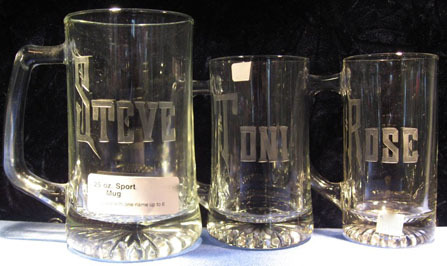 We can engrave this design on mugs or any of our glassware. If you look below on row 7 you will see our Nuance and Grand Nobles flute champagne glasses they are only $12.95 per glass engraved with the Irish Claddagh or other Celtic design and a 6 letter name. Additional engraving is .50 per letter or number. 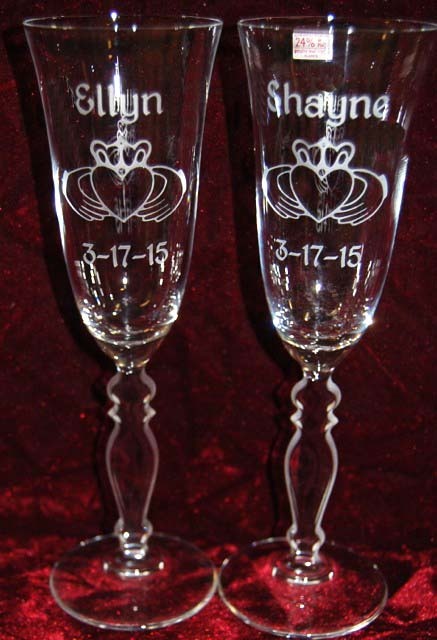 Signature Irish Claddagh wedding champagne flutes. These champagne glasses are $16.95 each engraved with the Irish Claddagh Celtic and a 6 letter name. Additional engraving is .50 per letter or number. 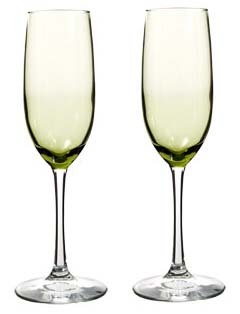 Our green wedding champagne flutes with a clear stem can also be engraved Irish Claddagh design. 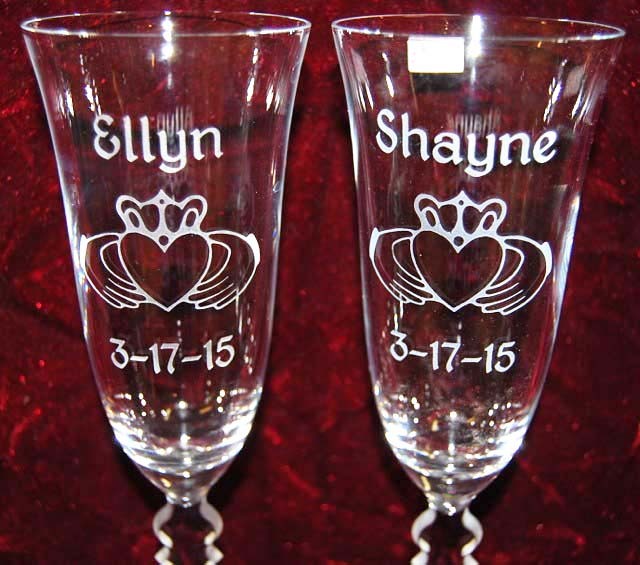 The clear stem champagne glasses are $16.95 each engraved with the Irish Claddagh and a 6 letter name. Additional engraving is .50 per letter or number. 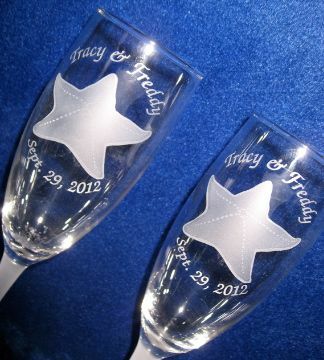 Our Victorian Crystal wedding champagne flutes, engraved with Irish Claddagh design. 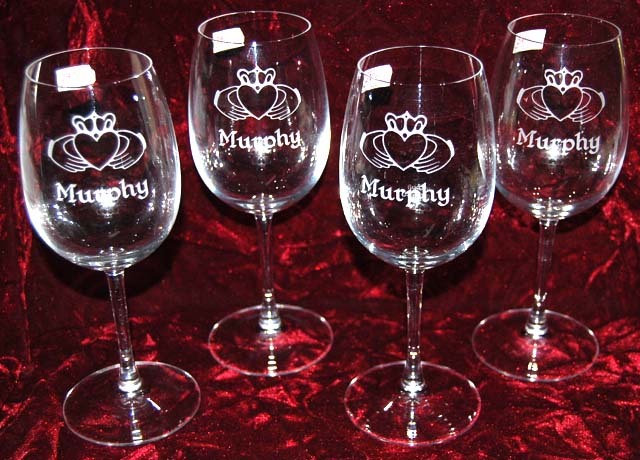 These champagne glasses are $28.95 each engraved with the Irish Claddagh Celtic and a 6 letter name. Additional engraving is .50 per letter or number. 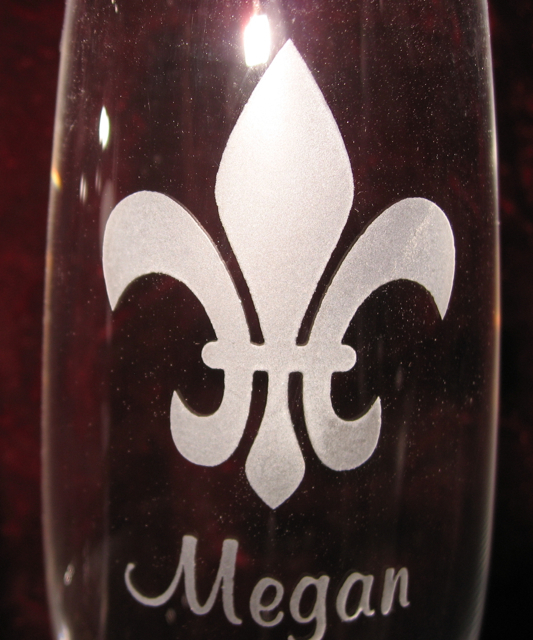 This Fleur-de-lis design be engraved on any of our wedding champagne glasses below. A 6 letter name is included. Additional engraving is only .50 per letter or number. Selection Lead Crystal 12 oz. wine glass engraved with the Irish Claddagh design. We also can engrave our Irish Claddagh design on any of our Beer glasses too. Engraving takes two to three days (Monday - Saturday) to complete - this does not include shipping time, shipping time is one to seven business days (Monday - Saturday) after the order is completed. If there are any delays, we will contact you by e-mail.